When deciding whether to work with a supplier, look hard at their website. Do they have a valid street address and phone number? (I personally have a hard time trusting a business that isn’t willing to disclose their location). If they have a street address, do a search on it on Google Maps. I was surprised recently after doing a search on a company who had a fantastic looking website; their “office” turned out to be a tired looking house. Look also at the Google page rank of their website. If it’s zero, chances are they haven’t been in business long. Handwrite thank you cards to your customers for their orders. This can be a personal way to show appreciation for their business. Continuously upgrade your knowledge base. Read books, watch videos, and keep tabs on websites that apply to your industry. Read up on new marketing techniques that other companies are using to grow their business. The business environment has changed radically in the past few years (especially since the meltdown of 2008). The companies that survive are those who adapt to change. When problems arise, use the phone. Unless there are points you need to communicate in writing (such as new prices or policy) it’s better to call a customer with unpleasant news than to email or fax it. While this isn’t fun, it gives them a way to vent their frustrations on the spot rather than stew in resentment. If you have a new product you’re developing, be sure to prototype it before going to production. This will save you the grief of receiving a shipment of merchandise that doesn’t work and/or function as it should. We have several excellent companies we refer our customers to for this service. Set personal goals. We often set business goals, but how often do we set personal ones? I’ve just begun to do this and am seeing the benefits. For example, I’m now making an effort to have lunch with my wife once a week. I want our relationship to be strong, and the only way this is going to happen with four kids is if we have consistent time alone. Setting personal goals will help balance out your life. After all, if your life is only about work then you’ll eventually burn out; this isn’t good for you, your family or your business. 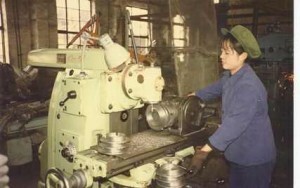 This is a picture from a factory I visited in one of my first visits to China in the 1980s. Note the blue Mao suit the girl is wearing (which they all wore at the time). China has come a long way since then. Now they have factories like those of Foxconn, with hundreds of thousands of employees who are making products for Apple, HP, and Dell.